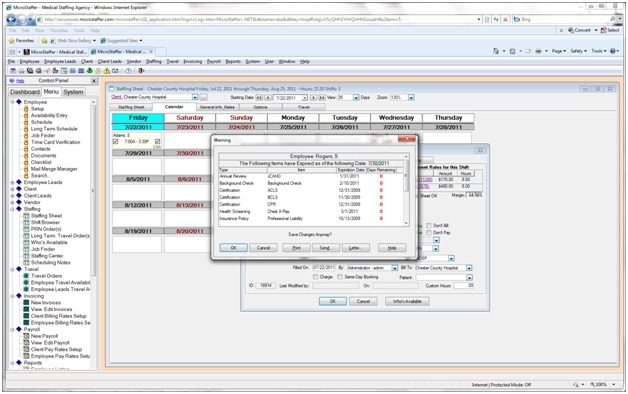 MicroStaffer contains numerous tickers that alert your staffing coordinators to important events such as scheduling conflicts, double-bookings, credential expirations and even upcoming birthdays for your staff. Bonuses, vacations and overtime ticklers can also be configured and serve as a valuable tool to avoid scheduling errors. Tickelers that warn of coming expirations for Licenses, Certifications and other credentials. Double-booking and both daily and weekly overtime warnings. Bonus pay and referral pay alerts. Warnings when someone is not allowed to work at a specific client (DNR). You can print, e-mail and even send text messages when ticklers come up.